This is the simplest of desserts to make but the flavours are exquisite. Mangoes contain polyphenols and dietary fibre which healthy gut bacteria thrive on. Polyphenols are produced by plants to protect plant tissues from the damaging rays of the sun, infections and herbivores. They also help plants to attract pollinators. 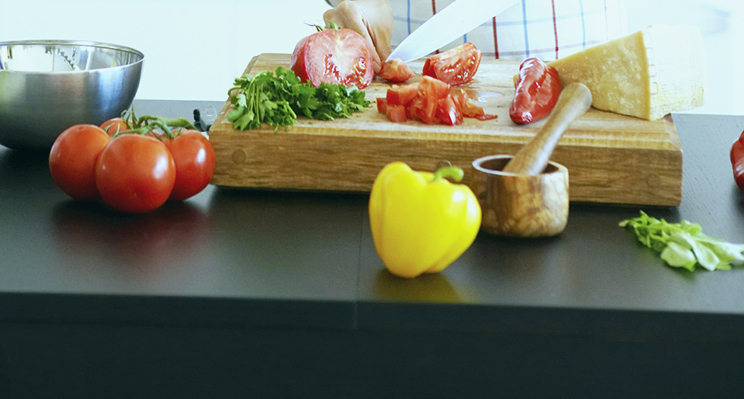 In the human gut polyphenols help to keep the lining of the gut wall healthy and free from disease. Place half of the mango into the bowl of a food processor and add the juice and zest of the lime. Begin to process the mango and juice and gradually add a little coconut water until you form the sorbet. Taste and if you want to add a little sugar do so at this point. Gradually add more mango and coconut water until you achieve the consistency you like. 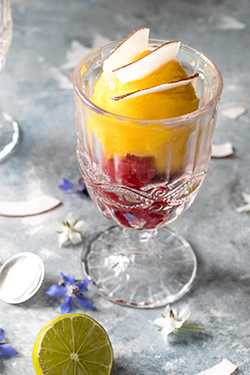 Place a few raspberries in the bottom of a tall glass and spoon the mango sorbet on top. Decorate with more raspberries, shaved coconut and fresh mint. Take the frozen mango from the freezer about 20 minutes before using it to it time to soften slightly. If the sorbet begins to melt and becomes too soft place sorbet in the freezer for a few minutes. Fruit purees made from processing mango, banana or raspberry can be mixed with a little thick Greek yogurt, and honey and poured into ice- lolly moulds to make delicious, nutritious ice-lollies which adults like as much as children. For a low FODMAP sorbet replace the mango with frozen raspberries or frozen bananas. To freeze bananas: remove the peel, cut into small chunks, place in a sealed freezer bag and freezer. Blitz frozen bananas in a food processor as above and add vanilla essence and a little maple syrup to make a delicious banana ice-cream.